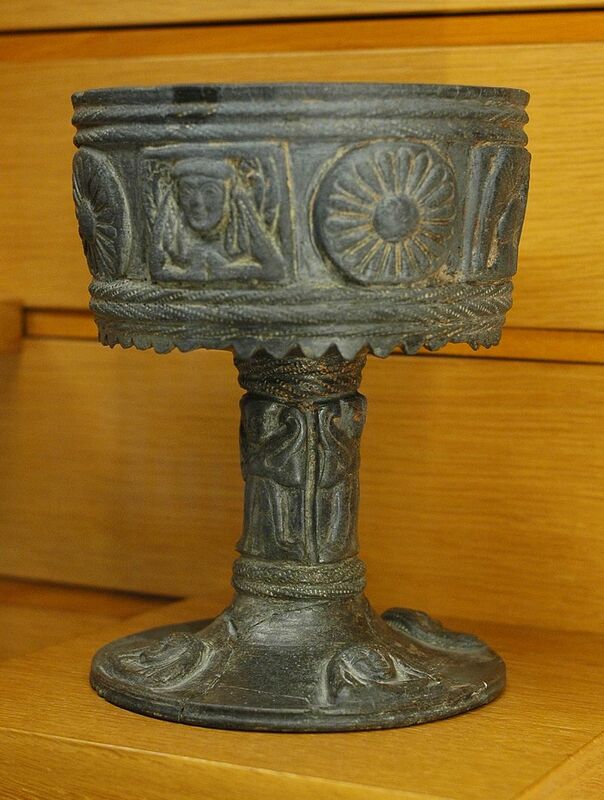 Etruscan bucchero, early 6th century BCE. Courtesy of wikimedia commons. The chalice represents the element of water and fertility, beauty, the womb, emotion, yin energy, instinct, intuition and the subconscious mind –the receptacle of spiritual forces. The round shape of the cup is symbolic of the womb. Water nurtures and sustains all life on earth –the life giving force from the goddess. The main purposes of the cup are consecrating the circle, toasting the gods, scrying, and ritual work. It is a variant of the cauldron of Cerridwen, also known as the chalice, bowl and cauldron. The cup is intended for ritual use and can be made of crystal, glass, stainless steel, or clay but should never be plastic. Plastic is not an element from the earth. A witch can make a cup by hand. This seals in the witch’s personal energies, adding more potency to the tool. The cup is a sacred and powerful tool for spells and rituals. When a witch uses his/her own tools in rituals, the tools store the energies and intentions of the witch. Tools can be stored or put away when not in use or left on display on the altar. The witch should have positive intentions when using the tools, because tools absorb them and when witches performs spells, the energy returns threefold to the sender. This is why it is critical to put forth good energies, making the spells successful and magickal. As a water symbol, the cup is placed to the west of the altar. It can contain mead, water, wine, or other liquids. When a bowl or cup is left on an altar all night, the water charged by the moon’s light becomes sacred. This gives a spell or ritual more power. When the cup is held upright during a ritual, it represents the open womb, ready to receive. When the cup is held inverted, it symbolizes birth and realization. When the athame is lowered into the cup it symbolizes the union of the goddess and the god. This is known as the small rite. In Glastonbury, near Chilkwell Street and Wellhouse Lane, are the Chalice Well Gardens. It is a sacred spring, its environment a tranquil place to meditate. In 1919, famous Glastonbury archaeologist, Frederick Bligh Bond donated the cover of the well, featuring a wrought iron vesica piscis, with a lance passing through it; it is based on a medieval design. The Vesica piscis is an ancient symbol of two interlocking circles where the circumference of one circle goes through the center of a second identical circle. The geometry symbolizes unions between heaven and earth or spirit and matter. The Chalice Well Gardens are but one example of the awesome symbolism of the cup in history. The cup is portrayed in the minor arcana of the tarot, representing intuition, depth, and insight. The suit of cups corresponds to the West or wind, the color blue, summer, yin energy, and lunar and tidal cycles. It is associated with the astrological signs of Cancer, Scorpio, and Pisces. The cup cards show watery images and represent emotions, psychic and intuitive arts, fertility, emotion, sacred sexuality and serenity. There is a trinity between the moon, women and water. The moon is associated with female energy and has always had an effect on the ocean tides. Magick is timed to the phases of the moon. Scrying, herbal infusions, drawing down the moon, and honoring gods/ goddesses are examples of magick associated with the moon. Diana, Hecate, Artemis, and Selene are just a few of the Deities associated with the moon. Clear quartz is associated with the moon, as are moonstone, silver and seashells. Moonstone is associated in particular with the moon goddess Selene. Moonstone is believed to change color with the phases of the moon. When a moonstone is attuned with the wearer, it can change color with the well being of the person’s aura. Moonstones are associated with the month of June and with positive things, such as happiness and prosperity. They are good stones for dispelling fears and bringing peace of mind and security. Wearing a magically attuned moonstone will enhance one’s psychic abilities. Silver is associated with the moon goddess Diana. Silver reflects the inner consciousness and is the favored metal of the goddesses. For ritual use, chalices should be silver and used with lunar herbs, which can be reserved for magick. Seashells are direct magical connections with the Goddess aspect of creation and the pull of the moon. Herbs, flowers, and other plants associated with the moon include anise, star anise, camphor, coriander, ginger, holly, hyacinth, iris, moonwort, orrisroot, poppy, pumpkin, roses, rowan, sesame seeds, and wintergreen. Hyacinth is particularly associated with the moon goddess Diana. Lavender and mugwort can be added when performing scrying or trying to improve psychic powers. Any of these plants can be used when performing a drawing down the moon ritual or consecration spell. It is important to cleanse, consecrate, and charge the cup or goblet. This serves three purposes: it removes negative residue from the object, melds positive energy with that of the Universe to bring divinity, and instills energy into the object for positive purposes. A spell is included below to use for ritual work, using the sacred elements of air, fire, water, earth, and spirit to bless the cup. Pass the tool three more times through the smoke of the incense, repeating the chant. If the tool is a chalice, present it to the Lord first and then the Lady. If it is an athame, present it to the Lady first. Thank the spirits and close the spell. The above spell is an example of how to empower a cup for ritual use. Although novice witches can use spells written by other witches, it is recommended for a beginner to write his/her own spells. It also varies with the tradition that the witch follows and the type of rituals performed. 4. Raymond Buckland. Buckland’s Complete Book of Witchcraft. Llewellyn Publications. 2001.